We’d love your help. Let us know what’s wrong with this preview of Dead Air by Cliff Protzman. He becomes willingly embroiled in the investigation by the not-so-innocent widow. The list of potential suspects is long, gleaned from the numerous ex Dead Air signals trouble at the radio station. Glenn Beckert discovers his high school best friend is shot in the head while on the air. Beck, the owner of Blue Water Security, is employed to provide security for the station. To ask other readers questions about Dead Air, please sign up. There is nothing better than a good mystery. Thank you to Mr. Protzman for writing a really good book. There is nothing "dead" about Dead Air. It has great characters, an intriguing storyline, and a few twists along the way. Glenn is no dummy. He leads the case solving in this story. Although, he has help in the form of an old flame, Irene and frenemy, Lt. Paglironi aka Pag. Pag and Glenn may not come out and admit it but they do respect one another and there might be a slight friend vibe. Irene There is nothing better than a good mystery. Thank you to Mr. Protzman for writing a really good book. There is nothing "dead" about Dead Air. It has great characters, an intriguing storyline, and a few twists along the way. Dead Air is the debut offering by the author. It's the first book featuring Glenn Beckett, the owner of Blue Water Security. "Beck" becomes involved in trying to solve the murder of his friend Richie. What at first appears to be a suicide, quickly becomes a murder investigation. Dead Air is an impressive debut for author Cliff Protzman. I was immediately drawn into this story full force when the main character Glenn Beckert gets a call that his friend Richie has been murdered at Z-rock, Richie's radio station. Beckert's security firm, Blue Water, provides security services for the radio station and his employee was on site when the murder occurred. The setting is one of the main characters. I grew up around Pittsburgh an Originally published on my blog: Nonstop Reader. The setting is one of the main characters. I grew up around Pittsburgh and the sense of place and the landmarks and 'vibe' is absolutely spot on. There are numerous mentions of local landmarks and reading this book took me right back there. The book is deftly plotted and definitely doesn't read like a debut novel in any way. The characterizations are well written and the dialogue is pitch perfect. I would call it modern noir; gritty but also upbeat and surprisingly humorous. The secondary characters are vibrant and really well written, especially love interest Irene who is smart and beautiful and a good counterpoint for Beckert. The clues are all there in the narrative and the denouement is well paced, exciting and satisfying. I'm really looking forward to more novels from this author. 321 pages, available in ebook and paperback formats. Five stars, doesn't get better than this. Investigator and owner of Blue Water Security Glenn “Beck” Beckert finds his friend Richie Zito dead at his radio station Z-Rock. One of his operatives was there at the time. Glenn feels that his employee is not telling the truth. Richie’s brother Ron is also at the station. When the police arrive, Beck has mixed feelings to find his old teammate Lieutenant James “Pags” Paglironi is in charge of the case. Initially shut out by Pags, he learns later that Pags wants his help. Together they will investigate the case. The widow Geraldine “Gerry” is naturally a suspect. She and Richie had what one might call an “open” marriage. They each had several sexual partners. Gerry is currently involved with a man called Vince Coleman. Beck suspects him of something. He and Gerry have a large connection to a local organization that provides assistance to the blighted areas of Pittsburgh. An encrypted file is found on Richie’s computer. Pags slyly slips Beck a copy of it and he takes it to Irene Schade who is an old love interest and a computer hacker. When the file is finally opened, it turns out to be a spreadsheet showing large money transactions between this organization and several offshore banks. Beck believes it is money laundering. Meanwhile he is being followed. He gets a beating in a parking lot. I appreciate the way in which Beck just didn’t bounce back up and keep going. It’s nice when the hero acts like normal people who would take a beating and hurt for days afterward. Irene and Beck are being followed. A police officer was able to get the license number of the car and Pags tells Beck who it was. He then visits the man and does some rough talking. After Beck tells Gerry about the file she disappears. Is she afraid for herself or is she protecting someone else? When Mr. Jenkins the head of the organization that is running the scheme is also killed the tension ratchets up. Beck must find Gerry. He and Irene think they’ve located her and then all hell breaks loose. The name of the murderer is somewhat of a surprise, but Mr. Protzman gave sufficient clues towards the end of the book to give it away. This is a remarkable book for a first time author. It is both very well written and plotted. It read linearly and made sense every step of the way. It had just the right amount of tension and delivered it at the appropriate times. Sufficient background was given on the main characters, but not so much that it intruded on the story line. I truly enjoyed the novel. I am very much looking forward to reading more of his work. 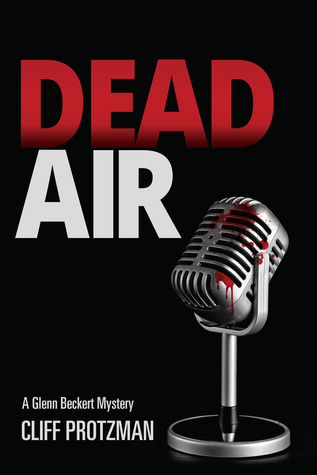 In his debut novel, Dead Air, author Cliff Protzman weaves a fast-paced gritty mystery suspense thriller set in Pittsburgh that follows Blue Water Security owner Glenn "Beck" Beckert as he investigates the murder of his best friend, Richie Zito, owner of Open Air Communications and its crown jewel, radio station WZOC, Z-Rock. Beck receives a call from his security officer at Z-Rock stating that after finishing rounds, he heard dead air from the studio, so he went to investigate and found Richie, In his debut novel, Dead Air, author Cliff Protzman weaves a fast-paced gritty mystery suspense thriller set in Pittsburgh that follows Blue Water Security owner Glenn "Beck" Beckert as he investigates the murder of his best friend, Richie Zito, owner of Open Air Communications and its crown jewel, radio station WZOC, Z-Rock. Beck receives a call from his security officer at Z-Rock stating that after finishing rounds, he heard dead air from the studio, so he went to investigate and found Richie, the Saturday night on-air DJ slumped over in his chair with a gunshot to the head. Beck partners with Pittsburgh Police Lieutenant James "Pags" Paglironi in the murder investigation, determined to find the killer and get justice for his best friend. Dead Air is a riveting story that is full of intrigue, action, drama, suspense, greed, and murder that easily draws the reader in and keeps them captivated. The murder investigation is filled with a growing list of suspects and motives, shady dealings and greed, money and power, and a multitude of clues, plot twists, and surprising turns that will keep them guessing what will happen next. Beck takes the reader on a wild ride when his dangerous investigative adventure takes him into the upscale areas and seedy neighborhoods of various Pittsburgh locales. With a multidimensional cast of characters who leap off the pages; gritty dialogue and vivid interactions; richly detailed description of Pittsburgh history and landmarks; and a no-holds-barred storyline that keeps the reader sitting on the edge of their seats as the dangerous investigation leads up to an explosive climax; Dead Air is one hell of a thrilling story that will leave you wanting more! Disclaimer: I received a copy of the book from the author/publisher in exchange for my honest review and participation in a virtual book tour event hosted by Partners In Crime Virtual Book Tours. I enjoyed this mystery. Protzman has crafted characters that are believable. The plot was a bit complex and involved illegal activities that had to be uncovered layer by layer. There was a good balance of plot development and action. Protzman did a good job with description, detailing just enough of a character's clothing, for example, so I could picture him. He did the same with scene description. Many restaurants and other businesses were mentioned by name. It gave me a sense of really experie I enjoyed this mystery. Protzman has crafted characters that are believable. The plot was a bit complex and involved illegal activities that had to be uncovered layer by layer. There was a good balance of plot development and action. Protzman did a good job with description, detailing just enough of a character's clothing, for example, so I could picture him. He did the same with scene description. Many restaurants and other businesses were mentioned by name. It gave me a sense of really experiencing Pittsburgh and even wanting to eat some of the food described. I like it when I learn something in a novel and in this one I found out about the radio broadcasting business and some details regarding encryption. I do recommend this novel to readers who enjoy a complex but well developed plot with believable characters. Dead Air is a murder mystery focusing on the death of Richie while on air. His death at first appears to be a suicide since Richie is alone in the locked room, with a gun. His best friend, Beck, who provides security is called to the scene and doesn’t believe it’s suicide. Beck is hired by the new widow to find out who killed Richie. Though this book is contemporary, it was written more like an old-time detective story. The story follows Beck as he investigates Richie’s death and finds there’s a lot hidden behind the scenes with the radio station. Every new clue Beck discovers provides a new suspect to keep you on your toes and trying to figure out who did it. If you enjoy reading true murder mysteries that let you solve the crime along with the main character, this book is for you. This story is full of twists and turns with plenty of suspects to keep you engaged. This looks to be the first book in the series, and was a great way to start the series. The author had an engaging writing style that pulled you into the story. I really enjoyed this story. I felt the author did a marvelous job with character development and storyline. I was captivated by the end of the first chapter and couldn't put this book down. I felt the level of mystery and the twists and turns this book took showed a great deal of planning and execution on the authors part. This is my first novel by this author, but I am definitely looking forward to reading more of their work! Highly recommended read! This is an intense mystery. I like the main character, Glenn Beckert. He's a smart, tough guy, who is quick to jump into an investigation when his long-time friend is murdered. From the beginning, Beck is suspicious of several people, and there are some strange things happening behind the scenes. Enough happens that it keeps your attention throughout the story. Irene is a worthy companion detective, as she helps Beck investigate the murder. I love the obvious chemistry between the two, and defin This is an intense mystery. I like the main character, Glenn Beckert. He's a smart, tough guy, who is quick to jump into an investigation when his long-time friend is murdered. From the beginning, Beck is suspicious of several people, and there are some strange things happening behind the scenes. Enough happens that it keeps your attention throughout the story. Irene is a worthy companion detective, as she helps Beck investigate the murder. I love the obvious chemistry between the two, and definitely hope for a happy ending for the two people. Through the book there are some tense moments, with Beck stirring up the ire of the wrong people. There are beatings, shootings and a remote cabin that has to be scoped out. Irene and one of the policemen, Pags, have their hands full keeping up with Beck and the people out to get him. I recommend this book, Dead Air. It's a satisfying read, with some great characters and suspenseful moments. Glenn "Beck" Beckert runs security for a radio station where his high school friend Zito works. While Zito is at work he is shot in the head. This puts being involved in the investigation. Beck finds out there is a long list of suspects. This book contains betrayal, mystery suspense, old loves, suspense. This is a mystery packed book leaving you wondering who did it? I really enjoyed this book a lot and would definitely recommend it! The mystery Dead Air was an interesting read for me, especially since it took place in Pittsburgh. I have family there and have spent time in the city. I enjoyed the way the story was narrated by the main character. You were with him as he followed the different leads to figure out who had committed the murder of his friend. I found it to be an enjoyable fast paced book. David spent his early days studying radio and all things audio. The idea that a disc jockey could be killed while on a live show has been approached a few times by various writers. Is the story plausible? Maybe, but one has to weed through countless profane words and advertisements for an adult beverage and a chain of sandwich shops to get to the actual story. The story moves well and, for the most part, the characters are believable. We think the author spends a little too much time describing the landscape in an attempt to hide the fact that he is plugging a sandwich chain. Is he getting a kickback? We hope so after all the times we had to read about this sandwich shop and the protagonist’s beverage of choice. On the scale of one to five, we have to give Dead Air four stars. We are not sure that the story is completely believable. This one is for readers that enjoy a good detective story. The main character is very likable. A fast paced crime mystery dealing with deception and dark subject matters. Like the author, our hero, Glenn Beckert, or Beck, had been involved in banking. He also thought about a future in baseball. But his career is now as a P.I. after several life disappointments and a general distrust of, and perhaps a dislike for, most people. If you have any knowledge of broadcast media, specifically radio, you know that when an on-air personality needs to take a break, for whatever reason, they play a long A fast paced crime mystery dealing with deception and dark subject matters. If you have any knowledge of broadcast media, specifically radio, you know that when an on-air personality needs to take a break, for whatever reason, they play a longer song or set of music or commercials. The trouble came when this song ended and nothing followed. There is nothing worse than Dead Air. Well, possibly murder. Beck's security firm was not only responsible for the safety of the radio station, the murdered man, one of the owners, was a close friend of Beck's. He is going to find out who did this, no matter those who stand in his way. The deeper Beck digs, the more complicated this mystery becomes. What is the true motive behind Richie Zito's death? Beck is not the only one who doesn't know who to trust. He calls upon his one time love interest to help him dig into financial clues. What she uncovers puts them even more in danger, and more focused upon by whoever doesn't want their plans disrupted. This case and the cover-up goes deep. Dead air is a big no-no at radio stations. As a high school student with a fifteen minute program, I was petrified of running out of things to say. I can only imagine how horrible that would be for a professional. This book highlights a more sinister way of causing dead air. Why did someone want Richie Zito dead? Who wanted him dead? Truth is there seem to be way too many people who weren’t all that upset with his death. Not even the DA and police really want to get involved. They seem to especia Dead air is a big no-no at radio stations. As a high school student with a fifteen minute program, I was petrified of running out of things to say. I can only imagine how horrible that would be for a professional. This book highlights a more sinister way of causing dead air. Why did someone want Richie Zito dead? Who wanted him dead? Truth is there seem to be way too many people who weren’t all that upset with his death. Not even the DA and police really want to get involved. They seem to especially not want Beck to be involved. This is one of those books I didn’t want to put down. Thank you, Mr. Protzman. I’m looking forward to more Glenn Beckert mysteries. A mystery with some grit, I loved the radio station. I've always been fond of them, and I've been in some. I have family who's worked in them. I didn't find the book to be seriously lacking in any area and it was a well-paced read. "Beck" as he is called was a pretty good character and as a debut book, this one works for me! My copy came from Net Galley. My thoughts and opinions are my own. This review is left of my own free volition. This was a good story. The characters were well developed and you can tell that this will be the first of a series. There is an interesting dynamic between Beck and Pags. Irene provides the romantic interest and technical partnership. I am looking forward to book two. This was a fast paced thriller. I particularly liked the main character Beck. This is the first book I’ve read by Cliff Protzman and it won’t be the last. The story went at a good pace and kept me hook until the end. Thank you #net galley for the opportunity to read this book. Cliff Protzman was a winner in the 2015 real life writing contest, Unfinished Chapters. He was born in Pittsburgh and attended the University of Pittsburgh. After a long career in banking and finance he is enjoying his passion to write. Cliff is a member of the Mystery Writers of America and Pennwriters. Cliff is an avid baseball fan, especially his beloved Pittsburgh Pirates.